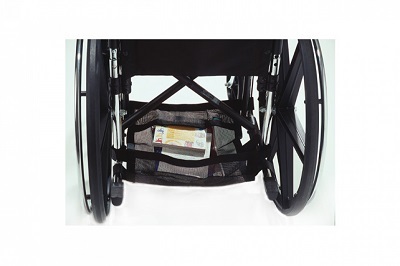 The EZ-ACCESS Wheelchair Underneath Carrier is a large mesh canopy that attaches underneath the wheelchair and is the perfect place to hold books, magazines, packages and several other items. Convenient hanging design with hook and loop attachment features front and back flaps to keep items secure. Made with vinyl mesh and comes with a one-year limited warranty. The Wheelchair Underneath Carrier easily attaches with hook and loop straps.